The B. Hudes Delicatessen was located here at 2703 Broadway from 1930 until 1946. The sign became visible again briefly in July 2014 when renovations were made on this shop location. The proprietor of B. Hudes Delicatessen was Benjamin Hudes (1880-1961). He was born in Austria in 1880, immigrated approx. 1902/1903, and died in New York City 18 June 1961. When Benjamin Hudes registered for the World War I draft in 1918 he gave his occupation as "cloak presser, Blonner Bros., 1372 Broadway." 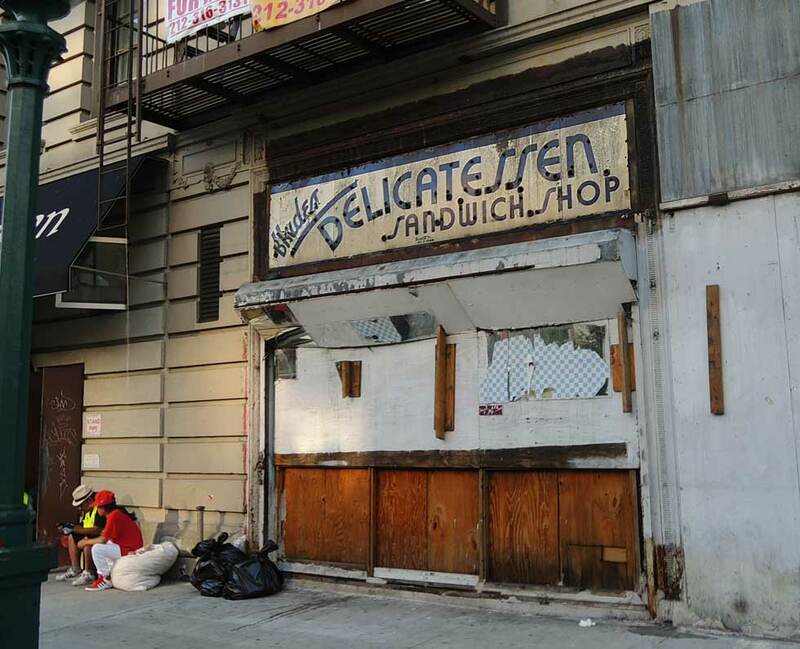 In 1919 Hudes opened a delicatessen at 1966 7th Avenue near 118th St. In 1924 this shop moved to 3605 Broadway near 148th St., and Hudes was in business here until 1934. Both Broadway locations were in operation during the period 1930 to 1934. 2703 Broadway was known as B. Hudes & Sons from 1930 to 1946. Benjamin Hudes's sons were Max Hudes (1910-1980), Edward Hudes (1911-1976), and Milton Moses Hudes (1916-2004).